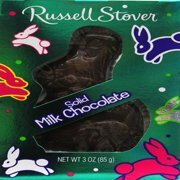 Product - Russell Stover Milk Chocolate Solid Easter Bunny, 1.5 Oz. Russell Stover Milk Chocolate Solid Easter Bunny, 1.5 Oz. Product - Russell Stover Milk Chocolate Solid Easter Bunny, 3 Oz. 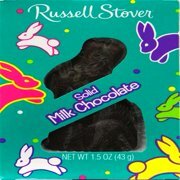 Russell Stover Milk Chocolate Solid Easter Bunny, 3 Oz. Product - Dove Milk Chocolate Bunnies & Chicks, 7.94 Oz. Dove Milk Chocolate Bunnies & Chicks, 7.94 Oz. 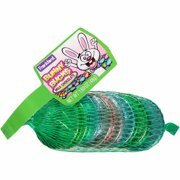 Product - Palmer Milk Chocolate Hollow Easter Bunny, 10 Oz. Palmer Milk Chocolate Hollow Easter Bunny, 10 Oz. Product - Palmer White Chocolate Easter Bunny, 2.5 Oz. Palmer White Chocolate Easter Bunny, 2.5 Oz. Product - Ferrero Rocher Hollow Milk Chocolate and Hazelnut Bunny, 3.8 Oz. Ferrero Rocher Hollow Milk Chocolate and Hazelnut Bunny, 3.8 Oz.